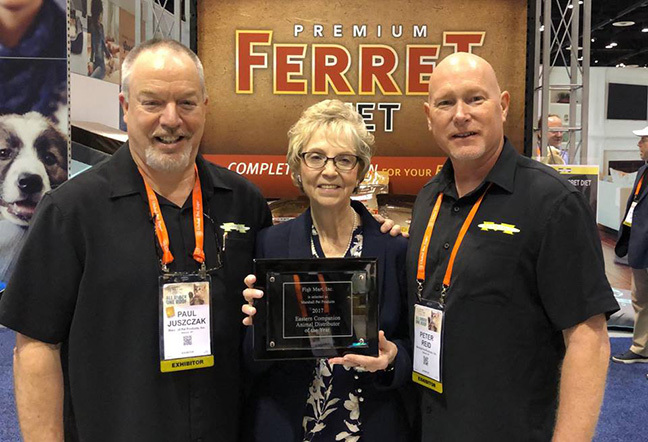 The World Pet Association (WPA) honored Laura "Peach" Reid, president and CEO of Fish Mart, a wholesale supplier of tropical fish and companion pets, with the Matsui Lifetime Achievement Award last night at the House of Blues in the Mandalay Bay Resort. Reid, who is serving her second term as chairman of the board of directors of the Pet Industry Joint Advisory Council (PIJAC), is known as a stalwart leader in the pet industry. She has been involved in legislative issues for decades, serving on numerous boards and committees. She has also contributed countless hours of time and money to support issues involving animal welfare, and she is a champion of pet-related issues and usually first to step up to the plate to address them head-on, according to WPA officials. Reid is the perfect recipient of the WPA Lifetime Achievement Award, said WPA board member and past chairman Michael Lasky of Schiaffino, Lasky & Associates. "Her contributions and commitment to pets and the pet industry are unsurpassed and so greatly appreciated," added Lasky, who presented the award to Reid before the start of the Kenny Loggins concert, which was presented by WPA. 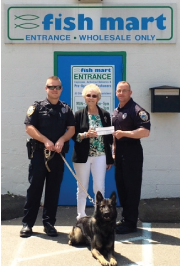 These are photos of a donation we at Fish Mart made to CPWDA, the CT Police Work Dog Association. Pictured are West Haven Officer Standish, Laura Reid and West Haven Officer Bloom with Cody. The donation helps fund the training of these and other police dogs. With over 40 years in the responsible pet industry, Peach is well-known for her business leadership and her community service. Currently the President and CEO of Fish Mart, Inc., Reid has served as PIJAC’s Board Chair since March 2016. 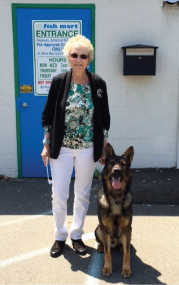 The Pet Age honor is just the latest for Reid, who in 1998 was honored as a “Woman of Substance” in the Connecticut Post, and received the Connecticut Small Business Person of the Year award in 2001. In 2015, she received PIJAC’s “Chairman’s Award of Excellence” in recognition of her tireless work on issues affecting the entire pet industry at the state and local levels across Connecticut. Fish Mart is Marshall Ferret Farm's EASTERN distributor of the year!